A great, well-rounded super-automatic, ideal for novices and those looking for convenience. Recommended for: Casual users. Coffee purists will want more control over milk frothing (if you’re a purist, deduct half a point from our final score). Do you love a great cup of coffee in the morning, and several more throughout the day? 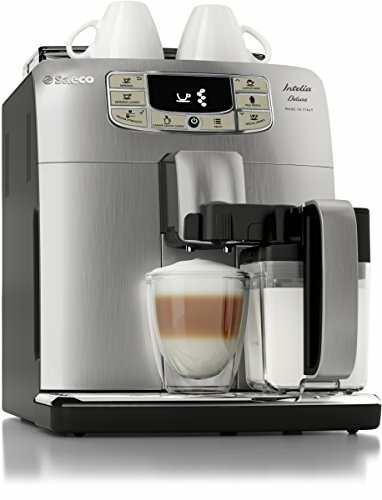 Have you always wanted a super-automatic coffee espresso machine that would give you the freedom to create advanced specialty drinks without requiring you to become a full-fledged Barista? If you answered yes to either of those questions, then you’re going to love our detailed Saeco Intelia review. This one was custom made with casual and hobbyist users in mind. It probably takes a bit too much of the control away for the purist, but there are a few features purists will love as well. We don’t want to oversell it, so we’ll be quick to say that it’s not a perfect machine, and it does have some shortcomings. We’ll go over all its strengths and weaknesses in detail so you can make an informed decision about whether or not it’s the right model for your household. Even if you decide to go in some other direction, we think you’ll agree – this is an excellent, capable, well-rounded machine. Let’s dive in and see what it has to offer! 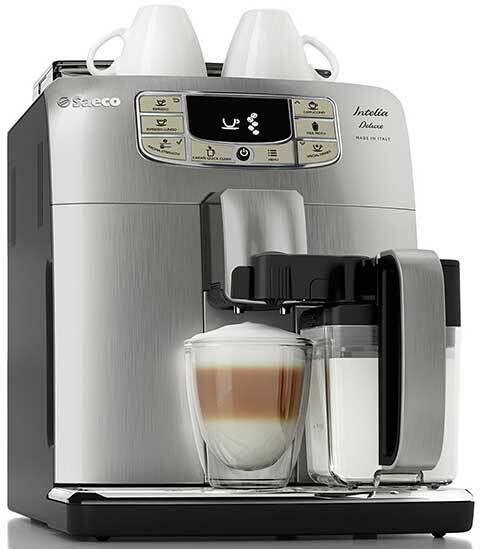 The Philips Saeco Intelia Deluxe has a relatively large footprint, measuring 17.4” x 12.5” x 21.5,” but because it is constructed mostly of sturdy ABS plastic, it’s significantly lighter than more expensive, stainless-steel machines, and weighs in at just 19 pounds. Plastic or not, make no mistake, this isn’t a cheap device, nor is it cheaply made. With a silver front face that looks like brushed metal and black sides and other accents, its modern, European styling hints at its Italian manufacture. And it should be noted that it’s got stainless-steel where it needs it. Both the drip tray and the Thermoblock boiler are stainless steel, which is exactly what you’d expect for a machine in this price range. The slightly elevated top-loading bean hopper gives it a vaguely futuristic look but owing to its overall footprint, people who have smaller cabinets with limited clearance between the countertop and the bottom edge of their cabinetry may have some difficulty finding a permanent home for the unit. Even if that’s the case though, its relatively light weight makes it easy to reposition as needed. The front-loading water tank holds 53 ounces, which is solid, but not exceptional. It’s a little on the small side for our liking, and although we didn’t count much off for that in our scoring, our Saeco Intelia review wouldn’t be complete without calling attention to that fact. It also features an optional water filter. We’re of two minds about using the filter. On one side of the equation, we completely understand why some people love it. Using the filter means you almost never have to descale the machine, which cuts down on the amount of routine maintenance you have to do. On the other side of the equation though, using the filters means that you’re on the hook to have to replace them periodically, which adds to the total cost of ownership of the machine. In the end, it comes down to a choice of convenience, at added cost, versus a bit more DIY to save a little money. There’s no right answer here, and the machine will happily accommodate you either way. 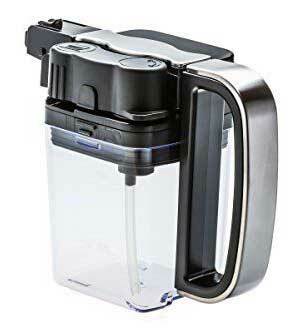 Note: You can use distilled water to accomplish the same goal, and thus minimize your need to descale if you don’t want to use the filter included with the unit, and buy periodic replacements for it. First, ceramic grinders are superior to stainless steel ones, because stainless steel tends to heat up when you use it, which can sometimes result in giving your grounds, and the coffee you make with them a burnt aftertaste that can completely ruin your drink. You don’t have to worry about that with this model. Second, and just as important, many comparable machines only give you five or six grind settings, and in our view, that’s just not enough. Getting the grind right is one of the key elements to a great cup of coffee, and everyone’s tastes are different. With ten different settings, you can dial the unit into your ideal taste preferences, which is awesome, and something purists will appreciate. All that said though, we do have one quibble with the grinder. To change your grind settings, you have to use a wrench. The wrench is built into the handle of the scoop provided for when you’re using the (1-scoop) bypass doser for those times when you want to use pre-ground coffee. While it’s a clever idea, and one less thing to keep track of, in our view, having to use a tool to change the grind settings is decidedly inconvenient. It’s not something you’ll notice if you’re the only specialty coffee drinker in your household and if you tend to drink the same thing every day. On the other hand, if your home has multiple coffee drinkers, then they’re probably each going to want to adjust the grinder to their particular tastes, and it gets old quickly having to reach for the wrench all the time, not to mention the fact that with all that use, sooner or later, somebody’s going to misplace the scoop, and then there will be some very unhappy coffee drinkers at your house! Associated with the grinder is, of course, the bean hopper, which is top-loading in this case, and holds a generous 10.5 ounces of beans. That’s a pretty good pairing with the water reservoir, although the water tank is a bit smaller than we’d like, there’s still good synergy between them. One problem you find in some super-automatics is that there’s a disconnect between the size of the bean hopper and the size of the reservoir. If one is big and the other is small, then it sets you up to have to constantly stop what you’re doing to attend to one, or the other, or both. Happily, the Intelia Deluxe avoids this issue, and we’re happy to see it. 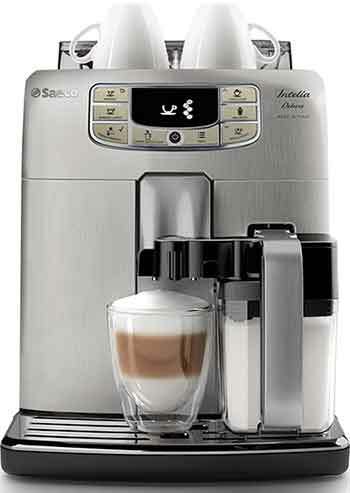 One thing we were a little underwhelmed by is the fact that the Saeco Philips Intelia Deluxe espresso machine only has a single boiler. 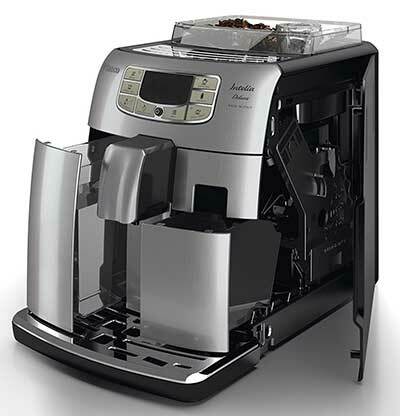 It utilizes Thermoblock technology, so you can adjust its temperature quickly to facilitate fast switching between coffee and milk, but the absence of a dedicated milk boiler does slow the machine down slightly. Note: This is not a deal breaker – we’re talking a matter of seconds here, not minutes, but we were somewhat surprised there wasn’t a second boiler, given the price of the machine. While it lacks a means of precise temperature control, you can adjust each drink’s brew temperature to taste, choosing from one of three settings (high, medium, and low). Given that most American coffee drinkers like their drinks hotter than their European counterparts, your best bet is probably just to set it on high and forget about it, only tweaking from there if it turns out to be too hot for your tastes. 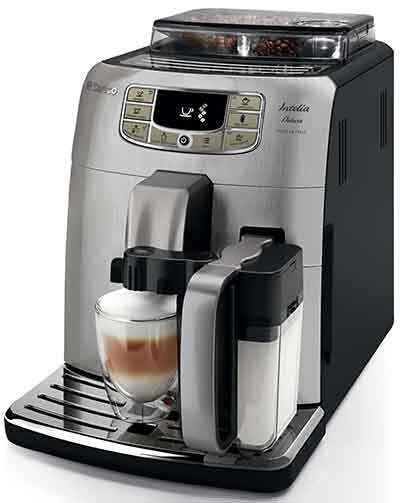 Using the highest temperature settings, the output for coffee and espresso is comparable to what you’d get out of a drip-brew machine, but if you make milk-based drinks, understand that the temperature of your final output will necessarily be lower as milk steaming can’t be done at the same high-temperature coffee is brewed at. Fortunately, this model offers a handy workaround for that, which we’ll get to in a later section! There’s not much to say here, except that the double coffee spigot is telescoping, so it moves up and down to accommodate a variety of cup sizes. You’ll be able to fit everything from a shot for espresso to your favorite coffee mug beneath the tap. Pro Tip: Take full advantage of the telescoping spigot and always place it quite near the rim of your cup. Believe it or not, this has a big impact on the character of your final output! This is the heart and soul of every semi- and super-automatic coffee machine. The brew unit being where the coffee magic happens, and the control system giving you the opportunity to shape and control that magic. The Intelia gets high marks all around on this front. The brew unit, accessible from the side panel of the machine, is removable for easy and convenient cleaning. It even has its own, dedicated drip tray (also removable) to keep the mess to an absolute minimum. Pro Tip: For optimal results, be sure to give it a good rinse at least once a week! For the Special Drinks option, the sky’s the limit. You can program in whatever you like, in addition to being able to completely customize every aspect of the regular offering. Especially nice is the dosing strength option, which allows you to select from among five settings (very mild, mild, normal, strong, and very strong). Of course, we like ‘em strong, and just set to max and forget, but everyone’s tastes are different, and it’s quite nice to have that level of flexibility. We also like the fact that when this machine detects something a miss, the entire LCD screen glows an angry red, which is guaranteed to get your attention. Adding to its user friendliness is the fact that atop the glowing red, are indicators telling you exactly what’s got the machine unhappy. Nice touch! Okay, if this model has one shortcoming, it’s the auto-frother. It's not really a shortcoming, but purists are almost certain not to like it. Newbies and casual coffee drinkers, however, will be thrilled. The milk frothing system starts with the carafe, which is made from durable smoke-colored plastic. Pour your milk in that, remove the detachable water spigot, plug your carafe into the spot, and select your milk-based coffee drink. The boiler will heat (and you get a handy temperature progress bar on the LCD, showing you the progress), then steamed milk and foam comes out. 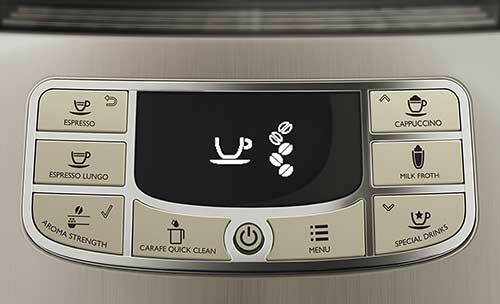 When that’s done, the boiler rapidly adjusts the temperature and brews your coffee. Done. From the customization menu, you can control the amount of froth in your drink, but generally speaking, purists want more control than this, and will not be pleased by the absence of a proper frothing wand. Sadly, this model just doesn’t offer one. The best part of this system though is that there’s no wasted milk. Just pop the carafe out of the slot when you’re done with the quick clean cycle, and put it back in the fridge for next time. Easy. If you’re new to the world of specialty coffee drinks, then you should understand the difference between the drip brew coffee you’re used to, and how these machines make espresso, which lies at the heart of most specialty drinks. A drip brew machine floods your grounds chamber with water and relies on simple gravity to dispense the coffee into your waiting pot. That’s not at all what happens inside your super-automatic, which relies on pressure to brew your shot. That pressure is measured in bars, and one bar is equal to the atmospheric pressure at sea level. It takes 9 bars to make a good espresso, and the Intelia is rated at fifteen bars, so you’ll have no trouble on that front. The machine will produce consistently good espresso for you for years to come! There are only two things to say on this front. First, the Intelia does have a warming tray, and it gets quite hot, so be careful where you stick your hands! Second, if you make milk-based drinks, you’ll probably want to use the warming tray. The reason? It’s just not possible to get steamed milk as hot as your coffee, so when you mix the two together, it’s going to lower the temperature of your final drink. Dispensing that drink into a cold cup lowers the temperature even further. Try it both ways, with and without using the warming tray first. You’ll be amazed at the difference! 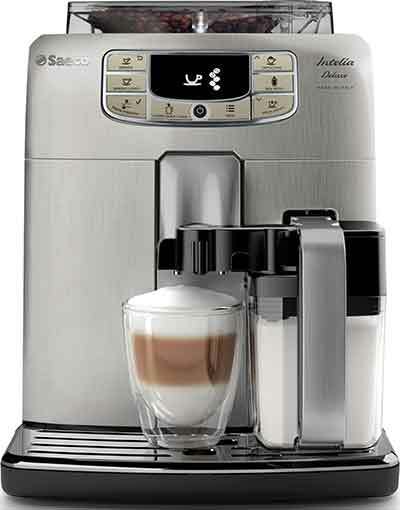 It’s a small, but surprisingly important detail, and we wanted to be sure to include a few notes about it in our Saeco Philips Intelia automatic espresso machine review, so you’d have a complete picture of exactly what this machine can do. In many ways, the humble cup warming tray is the unsung hero of the specialty coffee world! There are enough features on this model that it does have a learning curve, but the LCD screen makes navigating through the menus a breeze, and once you’ve made 4-5 drinks, you can fairly say that you’re well on your way to mastering it. You’ll get prompted to do a quick clean cycle after every milk-based drink you make, and you should definitely do so when prompted, in addition to attending to the other, more manual routine maintenance items like occasional descaling if/as needed, emptying the drip and dregs tray, and a weekly washing of the brew unit, but all of these things are super easy to do. We were quite pleased with the user friendliness of the Intelia, and rate it as one of its best features. Very newbie friendly! Again, none of these are deal-breakers, but they are worth mentioning and may impact your decision. We recommend it to more experienced users, with the caveat that you’ve got to be willing to put up with the relative lack of frothing control, thanks to the absence of a proper frothing wand. On the whole, an incredibly solid machine, and a great value for the money. Coffee's Surprising Health Benefits. WebMD. Brew Pressure Explained. Five Senses Coffee.